Everyone preaches the necessity of gauge swatching. There’s a reason. Normally I’m spot on gauge, but not this time. Knitting an entire sweater on a size 5US needle gave me pause. With the combination of wool, silk, and cashmere this yarn has a sensuous feel to it, especially when knit in stockinette. The fabric with the smaller needle is what I want but still I wondered. Ravelry to the rescue. There aren’t very many completed Nonpareil’s in the database and about half were using the Blackstone Tweed that the pattern spec’d. I read the comments on Blackstone Tweed, then I read the comments on Jo Sharp Silkroad Aran Tweed. Seems I’m not the only person having problems getting gauge with a size 7US needle on these yarns. There were comments stating that the Jo Sharp knit with a 7US needle stretched and grew. Not exactly what a gal wants from her go-to cardigan. One knitter wrote that she dropped down to a size 5US needle and the fabric didn’t become misshapen as it had for the others. Okay – so now I was feeling better about that smaller needle. Still, I washed both swatches and checked gauge again. No change. Hmph. So using a size 5US Harmony Circular I cast on the waistband. Yep, the waist is where you begin the sweater. It grows from the middle out (anyone else feel like there should be a laugh track inserted here?). The sweater has lots of shaping beginning with the waist. I’m excited about that since the last two sweaters have been quite boxy and less than flattering to my figure (or lack thereof). 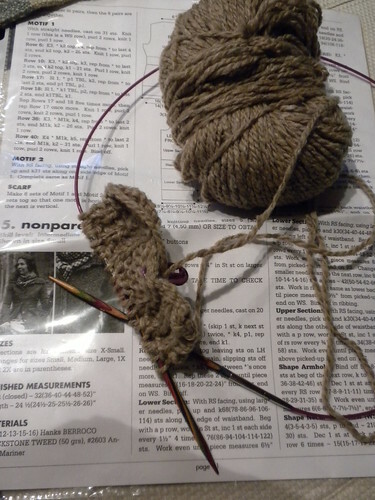 As my friend Cathy would say – “it’s brown, of course, you’re knitting a brown sweater.” She chides me regularly for the lack of color in my wardrobe. But come to think of it…I think every sweater I’ve ever knit for myself was brown of some shade or another. Maybe she’s on to something. Next sweater will not be brown…maybe it will be gray.